So many different groups say Tory-DUP deal breaches the rules – why don’t they team up? 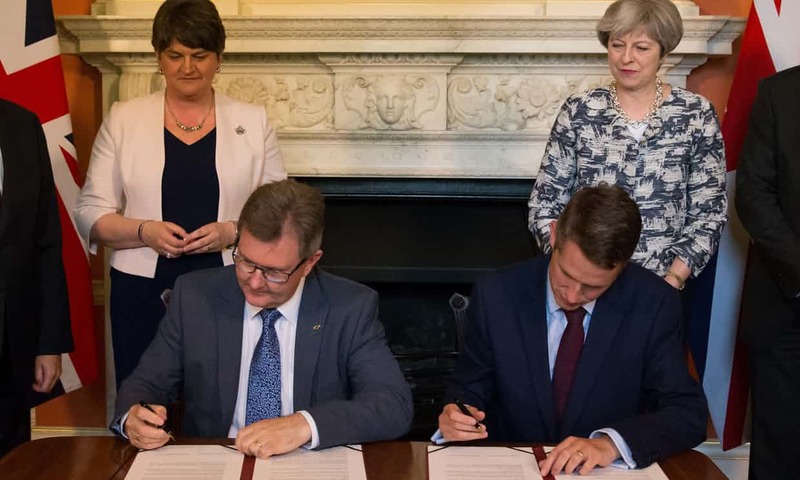 The confidence and supply agreement signed in Downing Street between the DUP and the Conservatives [Image: Daniel Leal-Olivas/PA]. We have already heard – several times – concerns that the deal between the Conservative Party and the DUP breaches power-sharing agreements in Northern Ireland. Now it seems the deal is questionable because spending commitments may breach equality duties. The people behind these claims have launched separate challenges, it seems. Why don’t they just get together and put the most forceful case possible? It seems to This Writer that Conservatives are very handy at doing everything they can to cling to power, and they may use contradictory arguments to undermine separate challenges. But that wouldn’t work if a single, unified challenge took place. Or am I being too sensible? The £1bn deal between the Conservatives and the Democratic Unionist party securing Theresa May’s parliamentary majority is being challenged on the grounds that the spending might breach equality duties. An exchange of letters between the Treasury and a prominent Northern Ireland human rights group… has raised questions about whether the extra funding will be allocated on a non-partisan basis. In July, shortly after the confidence and supply agreement was signed in Downing Street, the Committee on the Administration of Justice (CAJ) in Belfast wrote to the government in London raising concerns about how the money would be allocated. Fidelma O’Hagan, a solicitor with the CAJ, pointed out that the agreement implied that a “number of decisions have already been taken to earmark funding that have equality implications”. It would be nice to see these groups come together, after all the Tories rely on dividing their opposition.